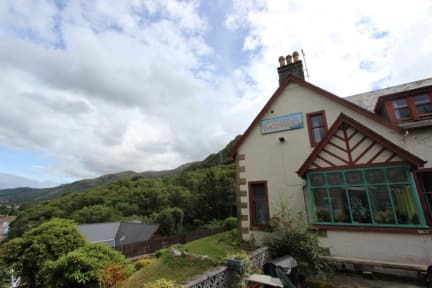 Fort William Backpackers is a charming Victorian building with a fun, friendly and relaxed atmosphere. We know how important it is to be able to relax after a hard day's exploring, and our cosy hostel is the perfect place to re-charge your batteries and share the tales of your adventures. Please note: Reception at Fort William Backpackers is not 24 hours. Reception closes at 12pm daily, and reopens at 5pm for check in. If you think you may be arriving later than 10.30pm, please let our reception team know so that we can inform our night porter. You are more than welcome to store your bags at the hostel for free if you arrive early, and make use of our facilities. Please help yourself to tea and coffee in the kitchen, make use of the free WiFi, and unwind in one of our many common areas. Our hostel car park is quite small and operates on a first-come, first-served basis. Our friendly reception team will be able to direct you to parking nearby if it is full. 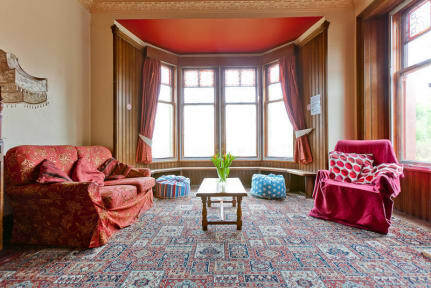 We have a fabulous, elegant lounge with a REAL open fire, books, games, a hostel guitar and probably the best view in town! It's a great place to meet like-minded people whilst drinking as much free tea, coffee & hot chocolate as you like! Our fully equipped self-catering kitchen comes complete with everything you will need to prepare your meals & packed lunches and has plenty of storage and fridges available for you to use. There are a couple of supermarkets within a 10 minute walk so it's easy to stock up with supplies and in the summertime you are welcome to use our BBQ on our patio. We serve an optional breakfast of fruit, porridge, cereal, toast, fruit juice & freshly baked Scottish scones. Its £3.00 for a wee bit of everything or, if you prefer, you can simply prepare your own. The choice is yours! Our lovely spacious dining room has great views out to the surrounding countryside and free WiFi. We also have a private Skype Den with its own cosy fire that's perfect for keeping in touch with loved ones and boasting about your latest adventures! If the weather's good, we'll be outside enjoying our patio area either having a BBQ or sitting around the fire pit enjoying the stars so come and join us. In the evening you can chill out in our lounge and exchange stories with fellow guests or stroll down to the choice of local pubs and restaurants that are literally minutes away. Fort William has a lively pub atmosphere and there is live music available on most nights. You can even have a dram or 2 of the local Ben Nevis whisky and head out to party Highland Style at the Skipinnish Ceilidh House. You can start (or end) both the 'West Highland Way' & the 'Great Glen Way' in Fort William and there are countless walking routes that are suitable for all abilities. Have a chat with us and we can recommend the best options for you and can lend you a map. Ben Nevis - Britain's highest mountain, sits just around the corner and below it, Glen Nevis - perhaps Scotland's prettiest glen, with its wonderful waterfalls and ancient pine forest. If you are planning on tackling the mighty Ben Nevis you will not be alone at Fort Willy Backpackers! Again our staff can give you advice and make sure that you are properly equipped before you head off. We can also arrange guided walks up Ben Nevis if you would prefer to go with qualified guides. If biking is your thing there are endless options of trails that cater for all standards of riders from beginner to World class level. The nearby Nevis Range offers the only lift served downhill biking in the country and is well worth a visit. If you want to bring your own bike you can store it in our shed and we have bike wash facilities available. There is also a good bike hire shop on the high street if you can't bring your own. There is a vast array of local water available for canoeing and kayaking and several outdoor activity companies offering a variety of activities. You can go canyoning or gorge walking, white water rafting and funyakking, horseriding or even paragliding! Even in winter Fort William stays busy with skiing, snow-boarding, mountaineering & ice-climbing all close to our fantastic location. Dramatic and eerie, Glencoe & Glenfinnan, and the Ice Factor in Kinlochleven, also await a few miles down the road and make excellent day trips from the hostel. If all of this sounds far too much like hard work then perhaps go for a boat trip on Loch Linnhe to visit the seals or just take it easy amidst the wonderful scenery. The Ben Nevis distillery, Inverlochy Castle, the Ruined Fort, and Glen Nevis can all be reached without breaking a sweat! You can perhaps catch the awesome steam train and head to Mallaig along one of the prettiest railway lines in the world. You even get to go over the Glenfinnan viaduct just like Harry Potter on the Hogwarts Express. Whether you plan to chill out or perhaps test your skills on a World Cup mountain bike trail...Fort Willy Backpackers is the place for you! Our friendly award-winning staff are committed to ensuring you make the most out of your time in Fort William. We also LOVE the outdoors and can give you our 'top tips' to help you plan your adventure. Our stay was amazing! Staff are incredible, everything clean and facilities are awesome. Best hostel of my life...the perfect concept of hygge! I couldn’t be more pleased with my stay. The staff here were absolutely wonderful. There were great facilities and location. If I had any tips for backpackers staying here it’s to bring groceries with you or grab them on the way from the bus station, though it’s only about a 20 minute walk to a lidl and plenty of restaurants near by. I would recommend this place to any traveller, and will hopefully be back soon! Many thanks for Andy for sharing his expertise on nearby hikes. As one of the more mature visitors and a person who has worked in hospitality world, I would up grade the kitchen and the cutlery and crockery, the shower room needed servicing. Andy who was on duty was a big help and cheerful we had a good mix of folk staying there at the same time. Stayed once April 2018 and again April 2019, a very comfy and welcoming hostel that I would definitely recommend. Didn't speak much to my fellow travellers either stay but the staff were lovely and genuinely interested. I had a very comfortable stay at Fort William. The atmosphere is very warm and very cosy so you feel right at home. The rooms are very clean. The staff are happy to provide information about the local area especially if you're hiking up Ben Nevis. Definitely recommend this hostel.